This topic has been explored more in the last decade than most. In fact, it’s an active part of millions of people’s daily regimen. It’s something that has brought more happiness than anything else. In fact, it’s something I personally have adhered to like cement over the past five years. It’s also a huge source of my own happiness. Happiness isn’t something that will last forever unless it’s properly cultivated. It’s made of properties that flounder quite quickly, especially if it isn’t embraced. It’s like a driver’s license; a privilege, not a right. You don’t actually own the happiness unless you embrace it and respect it. Happiness doesn’t come in physical form. It’s a mental thing. It’s something your mind creates from thin air. Well, not actually. Happiness is generated from thoughts, but that’s all. If you don’t take the time to visualize your goals in life, or make an effort to get to know yourself through properly understanding your passions and ambitions, values and beliefs, etc, there’s very little opportunity for you to embrace any realm of happiness. Happiness comes to those who believe in themselves; those who appreciate their lives, and those who are grateful. It doesn’t come to those expecting it, or those ungrateful. Happiness however is withdrawn from one who commits a crime, abuses others, or does something against their own values and beliefs. One of the best ways to visualize is to implement the Law of attraction. It’s been agreed by hundreds of scientists across the Nation that thoughts equal things. Although this may be tough to process, it’s an integral part of the Law of attraction and bringing it into fruition. With practise you will develop a strong ability to bring your thoughts into reality. Often times, I like to think of life as a video game. The mechanics are virtually the same. In fact, Google is one of the closest synthetic forms of reality (the online search engine). It may sound funny comparing our human reality with that on the computer screen, but video game technology is really a synthetic form of reality. In fact, there are endless options when producing these video games because everything is possible. That’s the interesting thing when comparing the two, the same goes with our human lives; anything is possible. Your reality is only as strong as your belief system. If you believe you can achieve it you will. If you don’t you won’t. Understanding this will enable you to embrace more powerful forms of thought. Think about it; your entire day is built on thoughts. Every aspect of your life is generated through thought. Every decision you make is based solely on the results of your thoughts. This in itself should entice you to start thinking more positive. Your life will not process anything you do not believe. 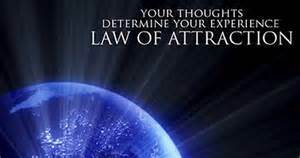 If you believe in the Law of attraction it will work for you. If you don’t it won’t. This exercise requires the willingness to explore your mindset. The Law of attraction is based on the belief that your thoughts are in direct reflection to the results you experience. This means; if you think positive you’ll reap positive rewards, however the opposite is true for negative thinking. If negative thoughts enter your mind you’ll flounder in negativity. I want you to take this information in and absorb it as though it were 100% tested, tried and true, because it has been. In fact, the Law of attraction has been assisting people to happiness for plenty of decades. It’s only recently been brought to public light. It works. You just need to let it work for you. Let’s start with a simple exercise that will introduce you to the Law of attraction. This technique is a visual exercise that’ll help you tap into your imagination which will allow you to alter the outcome of your future reality. I know it sounds a little too outrageous to believe, however those who believe in the Law of attraction are those living fulfilling lives, remember? First of all, find a nice quiet, comfortable place where you can relax. Somewhere out of the way of noisy distractions. You don’t need any props, just your mindset. Ideally, implementing breathing exercises before and after this experience is recommended, however, due to simplicity let’s skip the breathing stuff. Okay, imagine your ideal lifestyle. What does it look like? I want you to delve as deep as you can with this one. Imagine your ideal lifestyle. How old are you in your vision? Get as detailed as possible. Do you have any kids? If so, what are their names? What kind of career are you fulfilling? Take it a step further … what kind of money do you make? Are there any materialistic items, like a fancy car, or houseboat that you’ve added to your ideal image? Even think of the simplistic details. The ones you already overlooked. Are there any pets in the picture? Where do you live? Don’t just pick any house, imagine your most desired home. The one you saw the other day that made you gawk and awe as you drove by. Now let’s get into the nitty-gritty of it all. What type of coworkers do you work with? Who are your closest influences? What types of hobbies and passions do you fulfill? I think you get the point. The Law of attraction takes intense dedication and belief to be brought into fruition. Without the intense desire and belief in its possibilities you’re destined to fail before you even start. The more you practice the more rewards you’ll experience. This is a fun activity that will allow you to explore your imagination into great depths. When was the last time you tapped into your imagination this actively? The law of attraction helps you excel at your goals and ambitions. It’s the easiest way to keep track of your efforts in achieving optimal happiness. You are only one that can visualize your thoughts. This means; you’re the only one that can leverage the effect of your thoughts. By taking the law of attraction seriously you’re ahead of those that resist. It makes complete sense that thoughts equal things. This is why it has already helped numerous people excel in all areas of life. Those that resist its power will unfortunately continue living in mediocrity. I encourage you to take the Law of attraction seriously for at least thirty days. I guarantee you’ll be amazed with the results. I remember one of the first times when the law of attraction worked for me. Here’s the story. I had just ended a relationship with my first wife in September of 2010. We were separated for divorce. I felt lost and insignificant because I had lost my companion; the person I leaned on for support, and the one that had been there with me for the past seven years. Instantly I felt distant from society. It felt like I had lost everything I had worked towards. In fact, all of my previous accomplishments felt insignificant too. A couple of days after our break-up, some of my friends were trying to boost my spirits up because they saw how much of a negative toll the separation had taken on me. At first, they seemed like they were joking as they introduced to me an online dating site that offered the possibility of finding the perfect soul mate. I immediately thought it was a stupid idea however after talking to a few people around the table whom had already witnessed positive results from it, I decided to look at it with a little more depth. When I got home that evening, I rushed to my computer and turned it on. I had no idea what to do from there. I asked a friend to come over to help. In less than an hour later I had an active online dating account. It was kind of awkward at first, as I scrolled through all the various profiles. It felt like I was a customer at the grocery store looking for the best cut of beef (Okay, bad analogy), but I soon learned the algorithm of the online dating world, and I was well on my way to finding my perfect soul mate – at least that’s what they guaranteed. After a few hours I had read over a few dozen profiles. I then put the computer aside and pondered my thoughts about the whole online dating situation. I knew there were negative aspects to the realm, like having to financially afford the multiple dates and finding the time for it all; all of which seemed to be a hindrance, but I soon dismissed those thoughts altogether, turned my computer back on and continued searching more online profiles. It got addictive quickly. After eliminating all negativity from my mind, I grabbed a piece of paper and pen and jotted down every feature I wanted my perfect soul mate to have; like passion, charisma, sense of humour, etc. My list soon turned into a novel. I went into the great depths and wrote down every single thing that was important to me within a relationship. I no longer wanted to see failure within my close relationships. I was tired of seeing divorce in my perspective. I wanted to alter my happiness to a healthier state. This meant healthier relationships. I desperately needed to find someone who shared similar beliefs and values. Someone that would support my beliefs and encourage me to be the best I could be. I scribbled with my pen for hours. I wrote until I was tired of writing. After vigorously playing the happiness picture in my mind, I finally had a clear image of happiness; at least within a relationship. As I went through the hundreds of profiles thereafter, I listened to my instincts which told me who to contact. Four days later I met my exact description – Melanie. It’s been five and a half years since we met and I can say that I am happily married to my best friend. We now have two wonderful children together. They surely add to my happiness. Experiencing Melanie as my best friend has already been an incredible experience. We share the same goals, similar beliefs and we encourage each other on a regular basis. Life with her is exciting and passionate. After she came into my life I was sold on the law of attraction. I knew that if I found her with the power of my thoughts then I could use the same principles for my other desires. You too can experience similar results in your life if you let the Law of attraction work for you. You are the creator of your own destiny. You are the one that calls the shots in your life. Be proactive and don’t let time pass by too quickly without trying to find your ideal happiness. With a little effort you can find your passion, and with consistent effort you can take your passion to unbelievable heights. That passion, whatever it is, can be found by visualizing and allowing the Law of attraction to manifest your visions. Your deepest desires are waiting for you. The environment acts the same as it does for everyone. If you use your thoughts efficiently and you grasp onto the opportunities that come to you, you’ll bring happiness in abundance. Kerry’s master plan to living a fulfilling life will inspire even the skeptical. His revolutionary techniques to eliminating the negativity will encourage a wealth of prosperity to those who instill his methods into their everyday regimen. His proven success formula is driven through years of personal life tests and vigorous life enhancements. Everyone who has enlisted Kerry’s life coaching techniques have over performed within days.